Make your Hawaiian Islands dream vacation the best by finding the perfect hotel or vacation rental by owner in Waikiki and Honolulu on the Island of Hawaii. Just mentioning of a tropical Hawaii vacation brings thoughts of sunshine, beaches, grass skirts and fruity cocktails with tiny umbrellas. 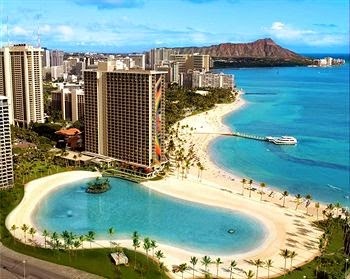 While you will find plenty of beach life in Waikiki-Honolulu, you’ll also find art museums, bike paths, hiking trails, a huge variety of dinning options and some of the most beautiful scenery in the world including the famous Waikiki area, with the soft sandy beaches and great surf. For unmatched views of the Hawaiian Island of Oahu, make the climb to the top of nearby Diamond Head – a 350-acre volcanic crater. Historic structures like Iolani Palace and Ali'iolani Hale are nice breaks from the beach scene and definitely worth a visit. Honolulu has it all - find the ideal Honolulu HI hotel room and start your tropical island adventure!